Andrew Young only published one book of poems and hymns, and that was in 1876 when he was sixty-nine years of age and retired from teaching. His selection comprises one lengthy work, 'The Highlands of Scotland', that runs to eighty-one nine-line stanzas, some hymns, and many elegiac offerings. From among these last the reader can share Andrew's grief from the loss of his young wife Maria on the 7th of December, 1847, and then their daughter, also Maria, on the 26th of December, 1847, aged three and a half years. NB ???? denotes difficult to interpret. A couple of days ago, on an off chance, I typed Maria Marvin into google and came up with your website and information about Andrew Young and his first wife Maria Marvin. 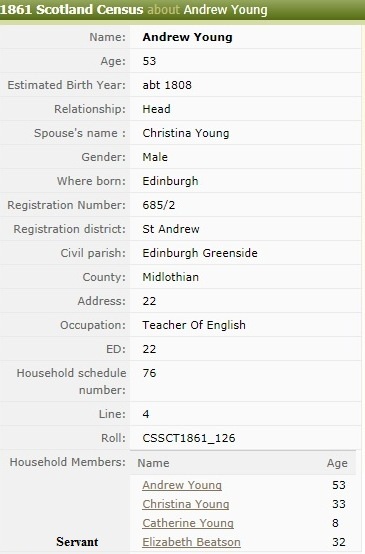 Given the poetry Andrew wrote in memory of his lost wife it may be nice for the image of Maria to be connected with the information on your website. The picture would also suggest that Maria child died just weeks after her own death and not at the age 3.5 years. 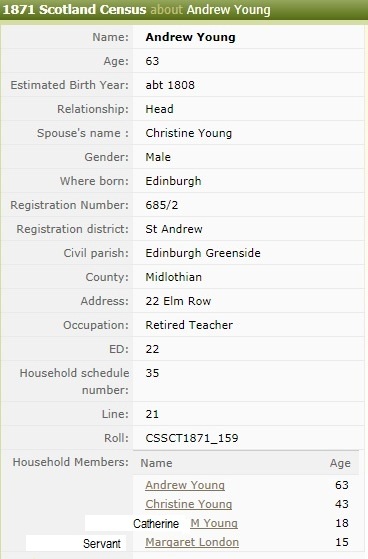 The revelations surrounding these sad events in a number of the elegies provide clues for an exploration of Andrew and his wife Maria's origins via genealogical birth/marriage/census/death data and post-1855 registration images. 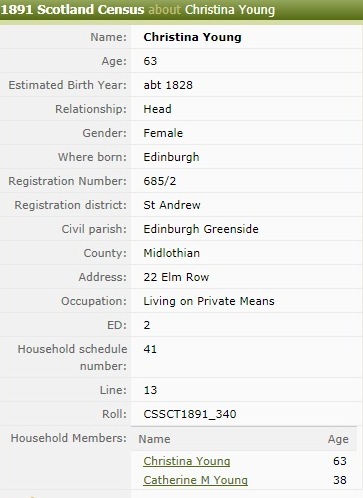 These provide snapshots of Andrew's subsequent life until it ends in 1889, when his death registration image in Edinburgh in 1889 confirms, not only previous findings about his parentage, but also his second marriage in 1851. There is no explicit mention in his poems about events during this thirty-eight year-long marriage, although he and his wife Christina Allan had one child, a daughter Catherine, born in 1852. The 1841 Census for Marylebone shows the Mivart family with Head of Family, John, aged c. 40, employed as an 'Upholder', Maria his wife, a teacher of music, also aged c. 40, daughter Maria, also a music teacher, aged 19, plus three more younger children, Emma, Alfred and Edmund. 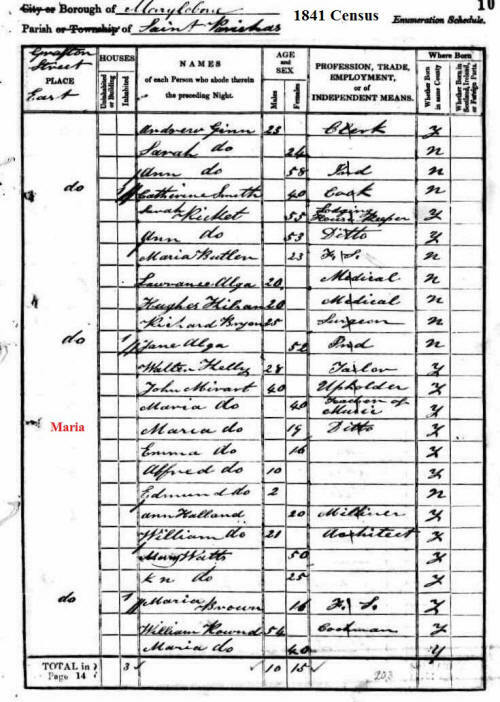 In his first elegy on his wife's death, Andrew states that she was 26 years old when she 'slept' away, and this equates well with Maria's birth date, and her age given in the 1841 Census. Extracted banns record for locality listed in the record. 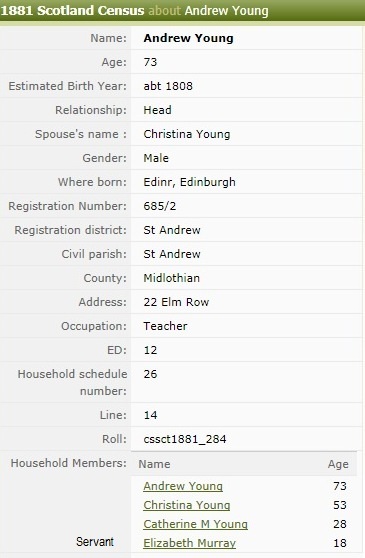 The 1861/1871/1881/1891 Censuses show that Christina survived until at least 1891 and that by then daughter Catherine was still a spinster. 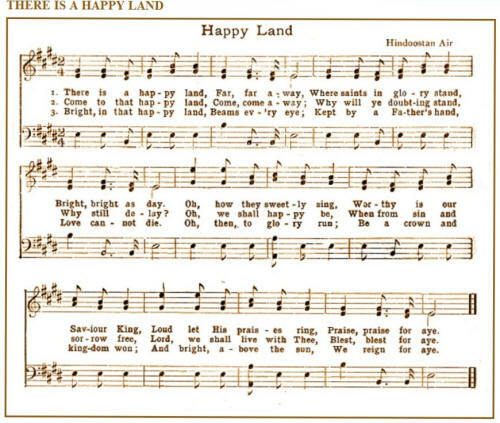 The words to "There is a Happy Land" were written by Andrew Young in 1838. They were adapted to a Hindustani air (often called "Indian Love Song") by Leonard P. Breedlove in 1850. 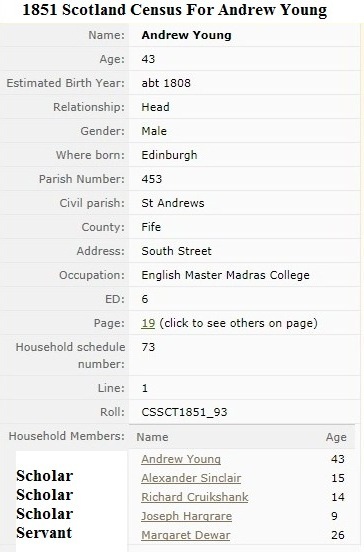 Andrew Young (1807-1889) was born in Edinburgh, Scotland, and was a Scottish schoolmaster and poet who served as the headmaster of the English department of Madras College, St Andrews, Scotland. 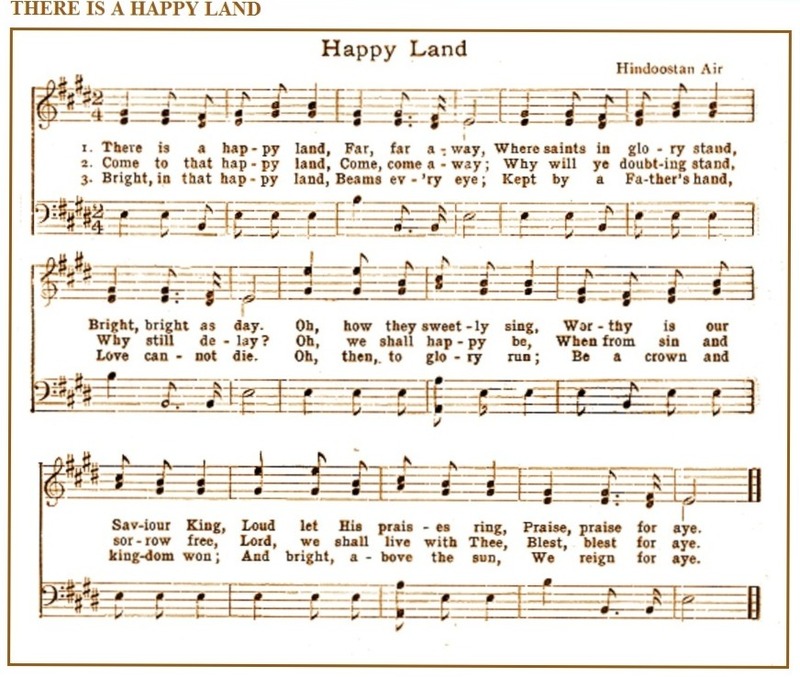 He wrote "There is a Happy Land" based on the lyrics of a popular parlor song which began: "I've come from a happy land..." because he thought the words could be adapted for Sunday school use.